This Skinny Mexican Avocado pizza with sprouted pizza base is what you want on your table tonight! It is the best clean eating recipe for the pizza lovers. Yep, it is 100% gluten free, dairy free and vegan. My family loves pizza night ! There is not a week without a pizz in our house. With Spring on its way I love to make skinny pizza, with no cheese and tons of vegetables. I don’t have much time to make my own pizza base so I am using the new sprouted pizza base from Home Street. 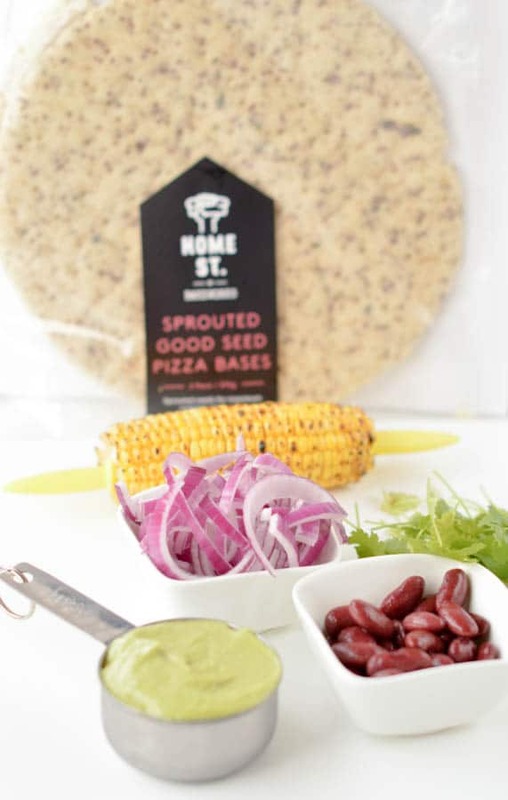 It is a delicious gluten free thin pizza base loaded with wholesome ingredients and activated sprouted grain. I am using those base for any pizza I make. It is the best pizza base I bought lately, super crispy, baked in 8 minutes and thin as I like my pizza. 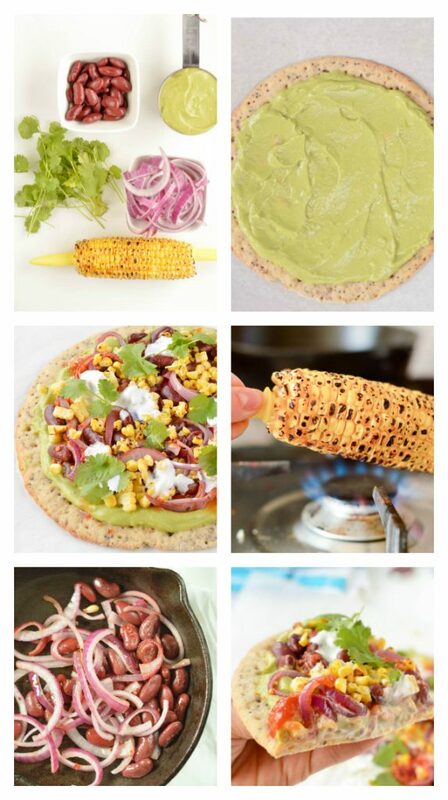 But let’s talk about this avocado pizza – or healthy Mexican pizza should I say ?! This recipe is ready in less than 15 minutes so its perfect for a quick dinner or to surprise your guest with a deliciously healthy appetizer. 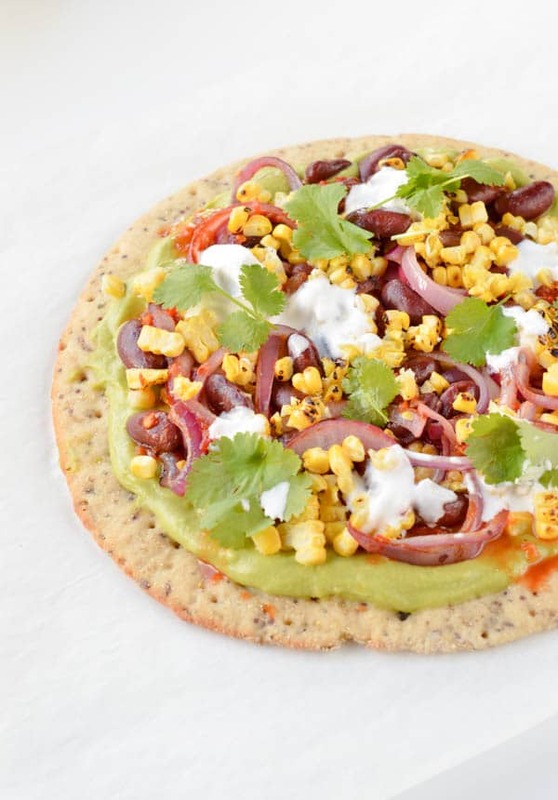 All you need to make this avocado pizza is 6 ingredients: some guacamole – or a very ripe avocado will do- delicious fried red beans and red onions, grilled corn, salsa sauce and coconut yogurt. Easy right? Well, I also love to add some fresh cilantro on top of my pizza and chili flakes to spice things up! But it is very optional. To make this pizza I simply pre bake the base for 8 minutes in the oven then spread my ingredients and serve immediately. The balance of hot crispy sprouted pizza base with the fresh guacamole and warm topping is the BEST! Look at this slice! Does this look amazing? 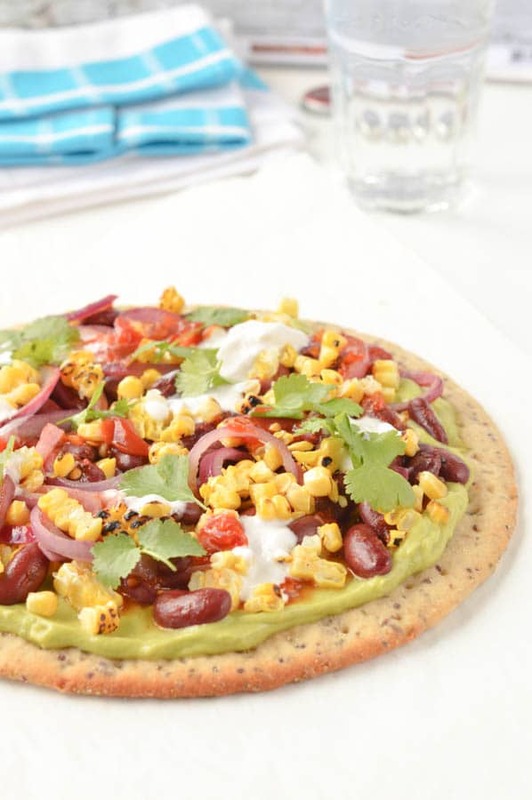 Easy Vegan Avocado pizza with Mexican toppings and thin sprouted pizza base. 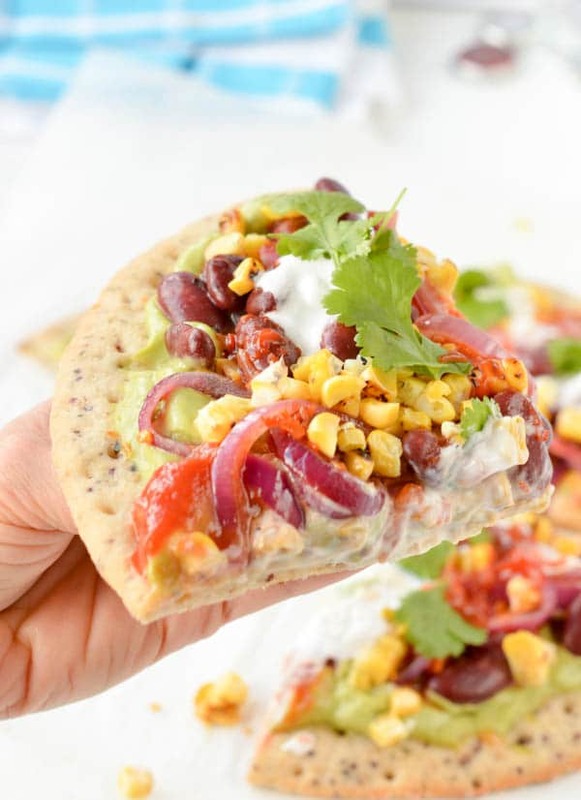 An healthy pizza recipe ready in less than 15 minutes with delicious toppings: fried black beans, red onions, grilled corn, salsa sauce and coconut yogurt. 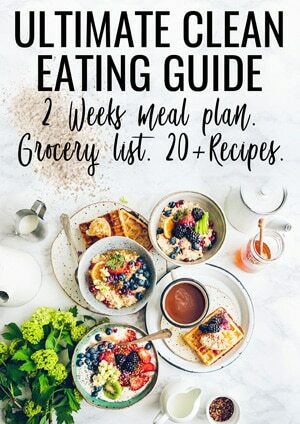 Gluten free+ dairy free + skinny recipe. In a small skillet, warm the olive oil and fry the red onion for 1 minute until fragrant. Add red beans, fry for 30 seconds. Remove from heat. Set aside. Place the sprouted pizza base on a pizza tray covered with parchment paper. Bake for 8 minutes until the sides are golden. Remove from the oven and leave on the tray to keep it warm. Spread guacamole all over the base, sprinkle grilled corn kernel, fried onion and beans and drizzle salsa sauce all over. It is optional, but for more taste add some dollops of coconut yogurt, fresh cilantro leaves and chili flakes. Beans: you can use canned red beans or canned black beans in this recipe. Yogurt: coconut yogurt is a dairy free yogurt (vegan) made of coconut cream and probiotic. Vegan alternative are soy yogurt or coconut cream. Guacamole: if you don't have time to make guacamole, blend a very ripe avocado with 2-3 tbsp of water, 1/4 teaspoon salt and 1/4 teaspoon garlic powder. It will make a great avocado base in no time. Corn cob: I am using fresh corn cob, cooked in the microwave for 3 minutes on high, then I simply grill the corn on my gas cook top. You can also use 1/2 cup canned corn if you like, simply drain well, rinse and fry with the red onion and beans for more taste. Nutrition panel is provided for one slice of pizza including all the toppings. This recipe serve 6 slices.